It Seems everywhere you look cupcake craze has taken over. Im not immune to the affliction in fact I have long deamed of opening a cupcakery with my girls, the 3 of us side by side up to our elbows in fluffy buttercream. 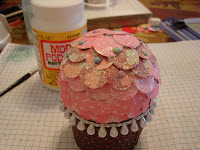 But until that day arrives I will have to settle for sweet sparkely confections made of paper and and bits of ribbon. These were inspired by an article in papercrafts magazine. Below are the instructions to create your own. 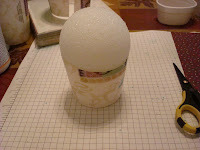 Cut a small disposable coffee cup to 2 1/4" with low temp glue attach a foam ball,I used a 3" ball here. 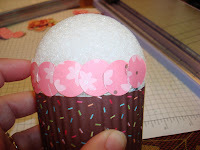 Cut a 12 x2 1/4" stip of paper and run through crimper, with sticky strip attach to cup, this will be your cupcake liner. Punch several 3/4" circles out of desired designer series paper. For mine I chose 3 different papers. 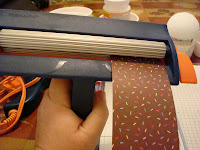 Begin attaching your circles with hot glue from the bottom working your way to the top, overlapping slightly.Push brads into paper and foam to create "sprinkles" and attach trim around edge. Paint on glue with paintbrush and sprinkle dazzling diamonds shaking off excess. Stamp cherry from simple birthday thanks, apply glue and coat with red glitter, let dry and cut out color in the stem with choc. 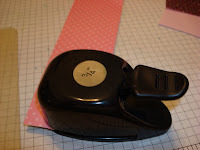 chip marker. 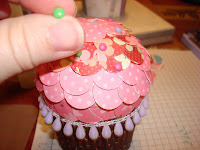 Place 2 glue dots to back of cherry and attach a toothpick, insert into top, repeat and enjoy! wouldnt these be adorable place settings? LOVE the cupcake. I can't wait to make them for each gal who comes to a workshop.....and maybe they will buy some cupcake stamps, too......ha ha. Thanks for sharing. I also love your blog site. These are so cute! 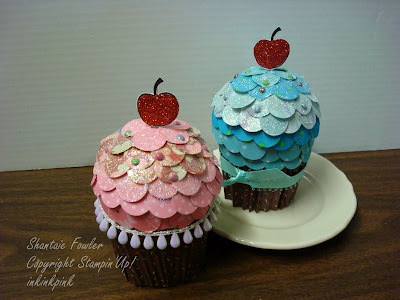 I have made cupcakes from fabric but never paper! I am going to have to try this! So pretty! This is SOOOOOO Stinking cute!!! I'll have to try it out. You did a super job. These are soooo cute ! You did such an awesome job bring this project all together. They loo good enough to eat! How lovely!!!! Thanks for showing how to do! I'm out of words. This is adorable!!! This looks good enough to eat. Thanks for sharing. I love how your cupcakes look. Thanks for taking the time to share how you made them. I think my cubscouts will love making these. I think we will try stapling ours because they can't use glue guns. These are just way too cute. Thanks for the wonderful idea. Project of the week, Demo swaps.